I played an hour of Dark Souls III last week, and I’ll be honest: My first instinct is to fall back on that old stalwart, “It’s definitely more Dark Souls.” It would be easy to do so, because it’s the truth. This is no Bloodborne-esque shakeup. No assumptions are being challenged here. The demo we played, set on a small section of the Wall of Lodeleth, was all pale yellow skies and crumbling castle walls. It was, in other words, Dark Souls. I can’t even say I feel bad about that cop-out. So much of this series is steeped in esoteric nonsense—from the lore to the game’s various systems—that to some extent it feels almost futile to delve into what’s changed between Dark Souls II and III. Much of what I could tell you is so seemingly inconsequential, it would read like any other game’s boring post-release patch notes. “Movement speed is 10 percent faster,” “Attacks chain together 28.7 percent quicker,” “Made it so not all shields parry,” (to use some made-up stats to describe real in-game improvements). The one new feature we’ve been shown is called “Weapon Art.” Ignoring the clumsy name, it’s a system that gives players a certain number of weapon-specific special moves that can only be used a certain number of times per bonfire. For instance, characters wielding an axe will “charge up” before combat, granting extra damage on each swing. Even Weapon Art is a small shift, though. It’s one new move per weapon, and a limited-use move at that. 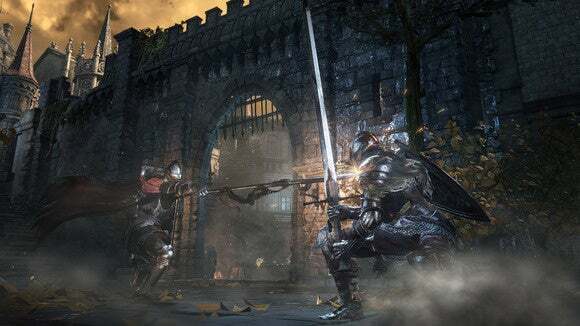 In an era of video game one-upmanship, where every new iteration of every old game needs its “big stand-out feature,” Dark Souls III is mostly obsessed with changing the micro. And what’s crazy is that matters. 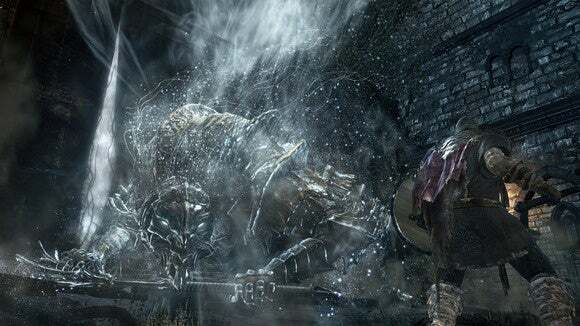 Any Dark Souls diehard can tell you that changing the way shields behave or increasing player speed or adding a new move for each weapon is—as silly as it sounds—a huge deal. You see the same thing in MOBAs and fighting games. A change of ten or fifteen frames of animation is a seismic shift, the addition of a new character a global meltdown. Dark Souls has backed itself into a corner, though. It was interesting to see Dark Souls III played in a group setting, because you get a feel for the game you could never get playing alone. I am not great at Dark Souls, nor will I ever be—it’s not a game I have the patience to get good at. But I could watch people who have played a ton of Dark Souls run the demo. One friend of mine beat the boss on his first try. Another made it from the first bonfire to the boss in probably ten minutes. They’ve achieved a certain fluency with the game and its systems, even slightly tweaked as they are in Dark Souls III. The problem being that Dark Souls—its entire premise—relies on players not having this fluency. Dark Souls didn’t make its reputation on being a realistic representation of medieval combat. Dark Souls made its reputation on being face-rockingly difficult. Obtuse. Punishing. Yet with each successive Souls game, the community untangles it faster. See, MOBAs and fighting games and high-level shooter play all share one thing in common. They’re multiplayer arenas. New tactics are discovered and dismantled in a constant game mechanic arms race that goes on and on until the community dies out. The number one player in the world might get bored up top, but for everyone else—from number two down to the bottom—there’s something to strive for. You can’t “solve” a multiplayer game. But Dark Souls can be solved. There’s really no good course of action for From Software, because each is antithetical to selling Dark Souls. I count three primary demographics: 1) People who’ve never played any From Software games. 2) People who only played Bloodborne. 3) People who are Dark Souls masters. I guess technically there could be a fourth category, “People who started Dark Souls and gave up,” but I’m not expecting many of them to play a sequel. 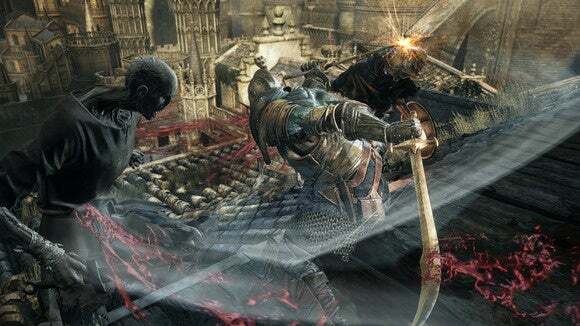 How do you make a Dark Souls III that is simultaneously easier (to draw in people that have never played before) and yet hard enough to make longtime fans—some of which have run the first two games dozens of times with all sorts of artificial constraints—feel like the game is difficult again? You can’t. I don’t think it’s possible. Look at the reception of Dark Souls II. It was not a bad game—in fact, I’m pretty sure I said it was excellent. But a lot of players whined that it was too similar, that it was too easy, that it was too much like Dark Souls. No Souls game will ever be as difficult as your first Souls game. And some players won’t care about that. I don’t, for instance. I appreciate that the Souls games exist in their little corner of the industry. I’ve enjoyed playing each of them for about thirty or forty hours before growing impatient. I had some fun running the Dark Souls III demo and dying. But the subset of players who would appreciate this article above and beyond an “It’s more Dark Souls” level—who would appreciate being told that not all shields parry, and who would understand the ramifications? 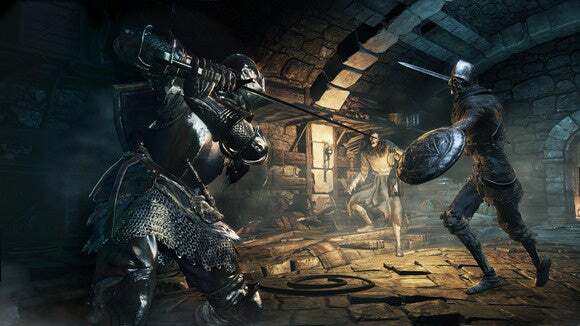 By and large they’re the people looking to recapture that original Dark Souls feel. They’re chasing the dragon drake. 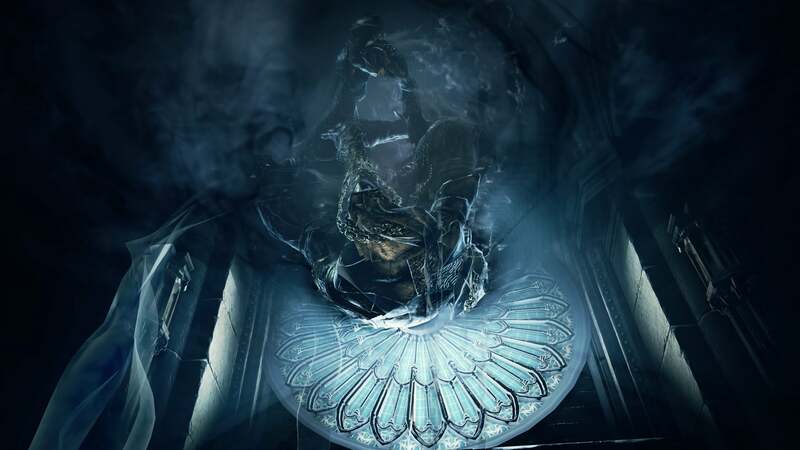 Part of what made Bloodborne so successful this year was that it kept the same core conceits as the Souls games—difficult bosses, rewarding patience, punishing arrogance—but rewrote the rules surrounding those tenets. Dark Souls can’t change that much. It can’t completely rewrite the rules of what it means to be a Souls game, or at least it’s not willing to do so. 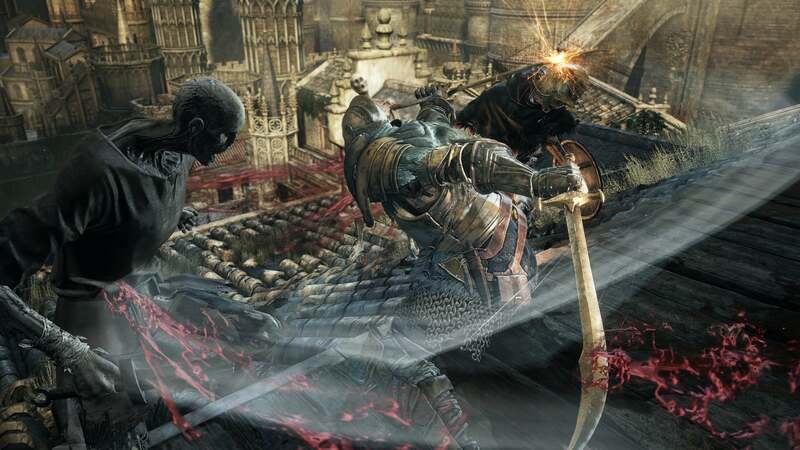 Each new Souls game reshuffles the deck, but you’re still playing with the same 52 cards. And for a game that’s built on needing to “solve” its systems, that’s a problem—if not for you personally, then for the absolute diehards at the core of the community. To be clear: I don’t think Dark Souls III is a bad game. In fact, I’m sure I’m going to enjoy it until I inevitably plateau. It’s got the same brooding atmosphere, the same creative monster design that I fell in love with the first time around. To me, “It’s more Dark Souls” isn’t a bad thing. But those who bought into the series because it was difficult and awkward and new, those looking for a real challenge or at least a “new” challenge, I think will have to wait and see what From Software and Hidetaka Miyazaki do next. Hopefully something Bloodborne-esque, something that rewrites the rules again (and not PS4-exclusive). Dark Souls III feels familiar, and for this series—and some of its core fans—that’s not necessarily a good thing.